However, for the predominantly male crowd aged 40 and over, some adorned with leathery well-worn faces, others looking a little less experienced in life, worrying about the consequences of standing too long under the rays of the strong northern Thailand sun is the farthest thing from their minds. Rather, scurrying to purchase a programme, selecting the right horse, placing a bet and hopefully winning a few baht is of far greater concern. It’s officially race day in Chiang Mai, the only day of the week the so-called sport of kings is offered to those who wish to partake, and behind the old tattered wooden benches men – some carrying bottles of whiskey placed in pails probably aimed at drowning their sorrows in defeat or celebrating in victory — mill about looking very concerned. Some appear to be intensely studying the programmes they purchased. All have the choice of placing single or group bets. 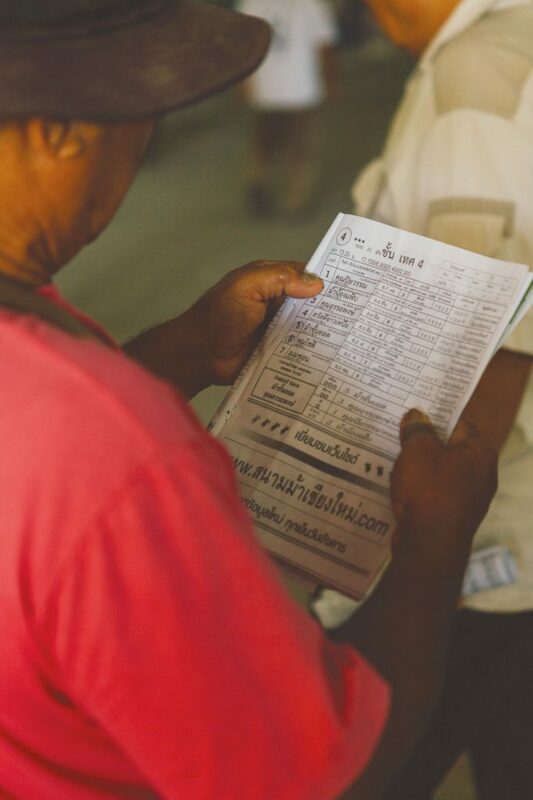 No matter the type of wager though — the minimum is 20 baht – the harsh reality is their hopes will be placed on jockeys riding atop elderly thoroughbreds which upon closer inspection have unfortunately seen far better days. “These are all class seven horses,” said Frank Adams, a former North Carolina, U.S. native now living in Chiang Mai, who has evolved into one of the rare non Thai horse owners since arriving here. He has owned three horses in the past, including his latest, Danny Boy. There are seven classes in the British horse racing system all designated by their handicap level — the weight range a horse must be in order to add fairness to the rest of the field. “Class seven are worst of the bunch, but they’re pretty nice horses. You never know who’s going to win in a class seven race. The average age is about eight years and oldest could be 11. These are all thoroughbreds, which aren’t even allowed to race in Bangkok. Only the Thai born horses can race there. But the Thai horses can’t beat the high class thoroughbreds,” added Adams. 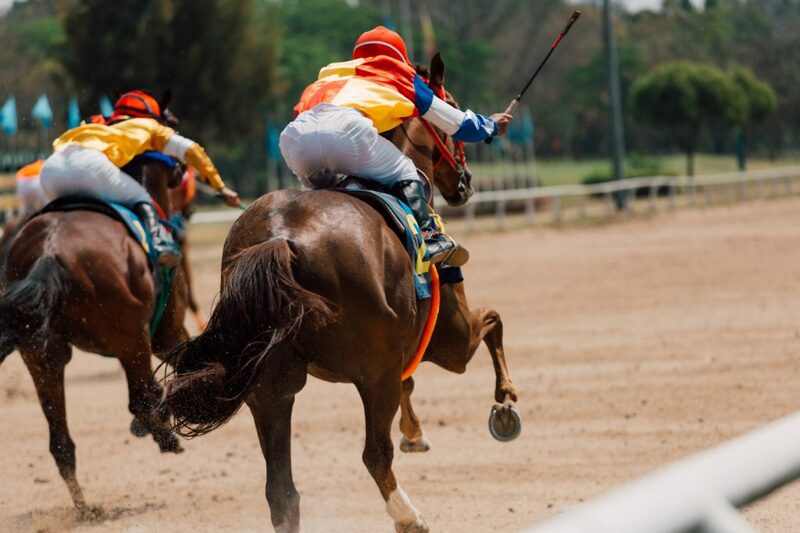 Horse racing was introduced to Thailand at the turn of the century after King Rama VI went abroad and took a shining to it. It’s the only kind of legalised gambling allowed in the country, but remains restricted to only once a week. In Chiang Mai, it is controlled by the military, as evidenced by the very visible military policemen patrolling the grounds on a constant basis while gazing over at the crowd. 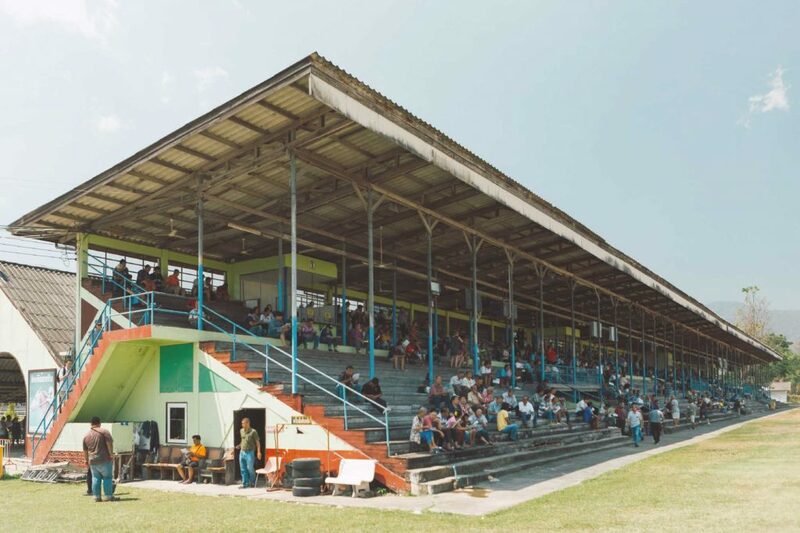 Nine races are normally held on each card during which time betters cheer their chosen horses on to victory either standing and peering or sitting on wooden benches in a building that looks like something out of a time capsule. Nothing appears to have changed since it was built in the early 20th century, except the consequences of age, making everything appear old, dusty and very run down. But to some, including the small number of expats who come down to spend some time sipping on a cold brew and taking it all in while not placing too much money on bets, the unique blend of seriousness and the non-conventional is the main reason they attend. DeMinico said he enjoys gathering information from talking to others. During those conversations, he also admitted he had heard rumours bandied about concerning alleged wrongdoings at the track. Still, he quickly added he was not in a position to question anything or anyone. United States resident Taylor Killough who hails from Louisville Kentucky and was visiting Chiang Mai with her boyfriend, said the unique atmosphere at the track actually reminded her of a strange mixture of an American baseball game mixed with horse racing. “It just feels a lot more informal than the races we see back home in Kentucky,” she said. Killough knows of what she speaks. Her hometown of Louisville is considered by many in the know as the home of thoroughbred racing in the United States, made famous by its hosting of the annual Kentucky Derby, one of the most iconic races in the world and often called the most exciting two minutes in sports. Peerapong, a 45 year old jockey born and raised in Chiang Mai and who has been riding and working around horses since he was 15 was entered into six races. He admitted he really doesn’t care if the horses he rides every Saturday are old, young, expensive or a bargain. All he wants to do is win as many races as he can and support himself financially. However, there are times he admits when certain matters are simply out of his control. Strangely enough, to the authorities who run and operate the track, horse racing is considered a game. 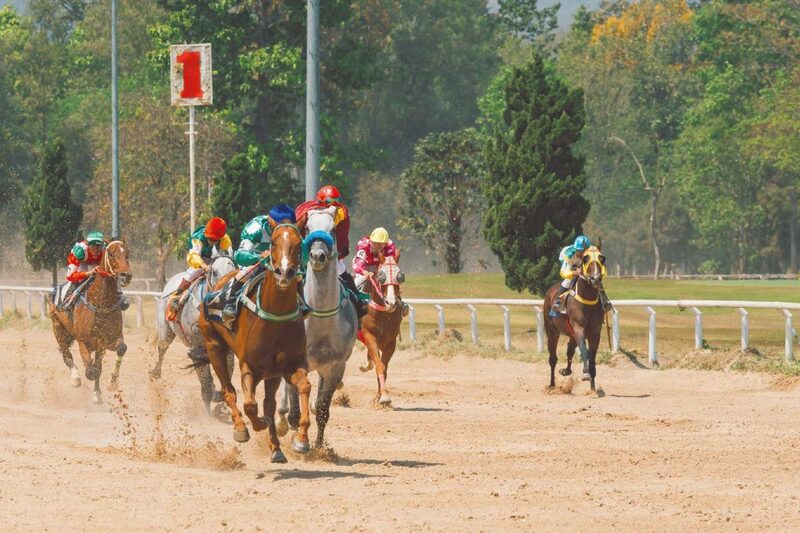 Despite its unique atmosphere and interesting ambiance, the state of horse racing in Chiang Mai remains in a troubled state. Attendance is consistently low, young people have turned their back on the sport, and no renovations for the dire clubhouse or other facilities are planned. Yet by the look of it, the loyal regulars that number about 300 in a grandstand that can fit about 1,000 people it will continue to return on a weekly basis. It has often been said that at least part of the key to inner happiness is the ability to find a job you truly love. 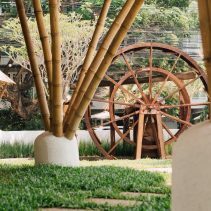 If you’re fortunate to have done so, then your chosen occupation will not seem like work, but rather be fun and enjoyable, and nobody can be a finer example of the latter than Chiang Mai native Peerapong. The 45 year old Peerapong began to learn all about the world of horses when he was a 12 and became a jockey soon after. He was introduced to the life by his uncle, also a jockey. Since that time, he has known no other profession and his love for the sport has never waned. Being a freelancer has served Peerapong well, and he was quick to point out that most local jockeys cannot live off the salary of one day’s work, but he has managed to do just that. In fact, he’s never had a second job his entire life. He often heads to the track during the week to practice and get the feel of things. 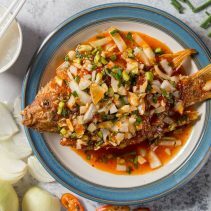 For anyone who has followed the sport of horse racing, it is common knowledge that all jockeys must maintain a certain weight level and Peerapong is no different. He definitely watches what he eats, but he has also learned to deal with it through a special diet that includes consuming lots of special herbs. He also abstains from drinking alcohol the day before and the day of the races. Like all athletes, Peerapong admitted he still has a dream of becoming the best in his chosen profession.